"Easily split and join files for faster transferring"
Transferring large files usually takes a long time and can be quite tedious, but the following application that we present to you is able to make the process much quicker. The Fastest File Splitter And Joiner (FFSJ), as the name might suggest, is a program that is capable of splitting large files into small fragments, which you can easily and quickly transfer to another device. The program will then join the pieces together to restore the file to its original state. 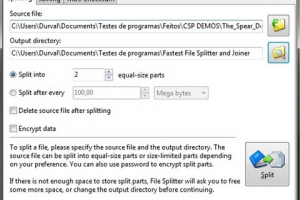 The Fastest File Splitter And Joiner has many options and settings that you can configure. It allows you to determine the number of parts which the program should split the file into, and the maximum size of each fragment. It also features a very friendly and easy-to-use interface that makes the process of either joining or splitting files a breeze. The tool will integrate itself with Windows Explorer and it uses an advanced encryption algorithm, that will make your data more secure when transferring it to another device.